A quality homemade mix can be made with peat moss, forest compost, or prepared with a soilless mix that is purchased from the store. Store-bought goods are easier to work with because the pH is at the desired level and it is mixed with perlite and / or vermiculite, lime, and other goodies. On the other hand, homemade mixes are a lot cheaper, often less than half the price. 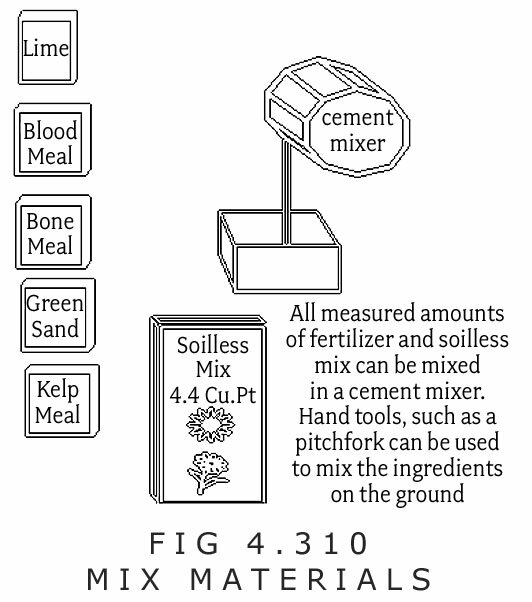 Organic recipes for soilless mix are described on pages 167 to 174. 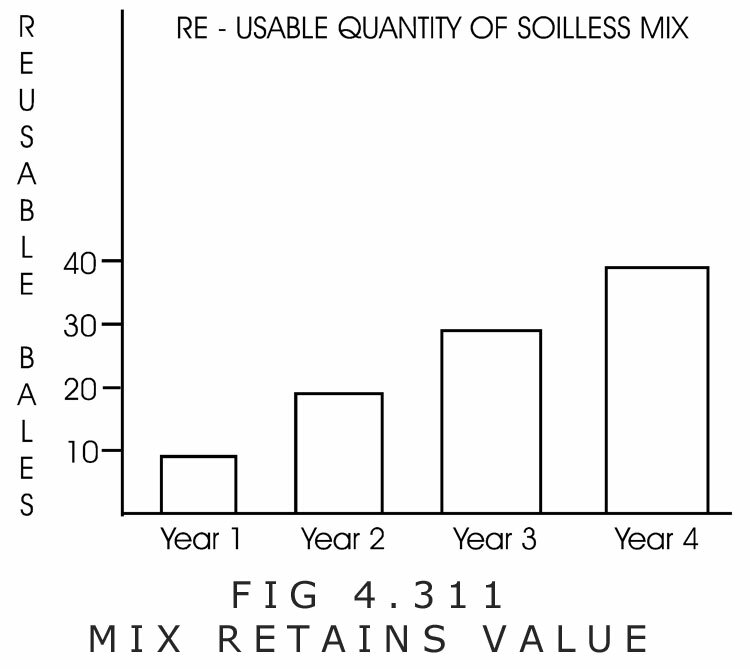 When soilless mix is purchased, it is sterilized and has a pH that needs no further adjusting. However, forest compost and peat moss can be substituted for soilless mix. The key is to get the pH right (5.5 to 7.0). Most forest compost has a pH of 5.2 to 5.5, while peat moss has a pH of 4.0 to 5.5, depending upon the source. When perlite and lime are added to peat moss or forest compost, the outcome is a basic soilless mix. Here is a formula to raise the pH and prepare a quality mix using forest compost or peat moss. 1. A 20-gallon garbage can (like the cheap Rubbermaid) is filled two-thirds full with rich, black forest compost or peat moss. 2. Perlite is added to the top and mixed thoroughly. The contents can be emptied and mixed on the ground with a pitchfork or gloves. A grower should wear a respirator or good dust mask for all mixing. A cement mixer is another option. 3. 5 to 6 cups of fine dolomite lime (with or without 3/4 to 1 cup of hydrated lime) is added and thoroughly mixed in. A grower can make homemade mixes before adding the fertilizers to the homemade soilless mix. Mix recipes are described on pages 167 to 174. Forest compost comes from a mature forest. It exists in a mature forest under a layer of sticks and needles. It is located a few inches beneath the needle layer. Some stores sell forest compost mixtures. It is usually free of stones, has a pH greater than 5, and should contain beneficial mycorrhizae. All loose roots should be removed from forest compost before it is used. Peat moss comes from peat bogs. Peat bogs exist in areas of poor drainage that stay wet all year long. Note: quarts and liters are about equal, and 4 quarts = approximately 1-gallon. A. 1. Four 3.8 to 4 cubic foot bales of Sunshine #2 Mix, Jiffy Mix, Pro Mix, or other soilless mix. 2. Four bags of composted steer manure (20 to 30 quarts each bag). 3. One gallon of blood meal. 4. One gallon of steamed bonemeal. 5. One gallon of greensand. 6. Two quarts of kelp meal. 7. 0 to 50 quarts of perlite and / or 0 to 50 quarts of vermiculite. 8. Up to 1/3 parts soil. Note: mix without soil is classed as organic hydroponic. B. 1. One 3.8 to 4.0 cubic foot bale of Sunshine #2 Mix, Jiffy Mix, Pro Mix, or other soilless mix. 2. One 10kg bag of Welcome Harvest Farm Flower Power. 3. 1/2 to 1 bag of composted steer manure (10 to 30 quarts). 4. One quart of alfalfa meal. 5. 0 to 40 quarts of perlite. 6. Up to 1/3 parts soil. C. 1. One 3.8 to 4.0 cubic foot bale of Sunshine #2 Mix, Jiffy Mix, or Pro Mix. 2. 5kg of Welcome Harvest Farm Flower Power. 3. One 20 to 30 quart bag of composted steer manure. 4. Eight cups of canola meal. 5. Three cups of blood meal. 6. One quart of greensand. 7. Perlite and vermiculite, as desired. D. 1. One 3.8 to 4.0 cubic foot bale of Sunshine #2 Mix, Jiffy Mix, or Pro Mix. 2. 1/2 bag (10 to 15 quarts) of chicken manure. 3. 1/2 bag (10 to 15 quarts) of composted steer manure. 4. Four cups of blood meal. 5. Four cups of kelp meal. 6. Four cups of greensand. 7. Four cups of steamed bonemeal (pellet form). 8. 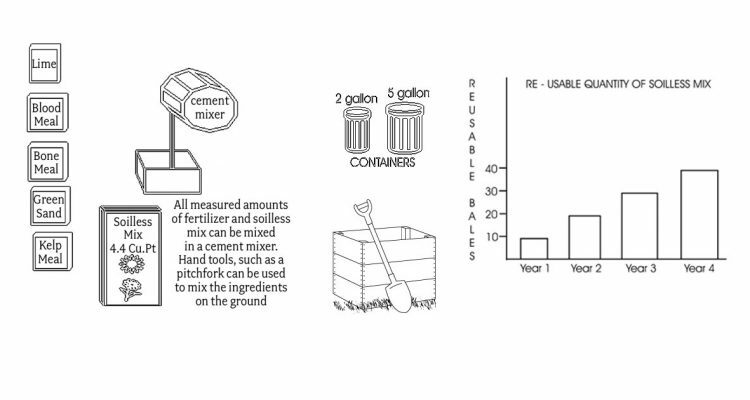 0 to 4 quarts (liters) well-decomposed compost. 10. Up to 1/3 parts soil. E. 1. One 3.8 to 4.0 cubic foot bale of Sunshine #2 Mix, Jiffy Mix, Pro Mix, or other soilless mix. 2. One bag of mushroom manure (20 to 30 quarts). 3. Two cups of langbeinite. 4. Four cups of greensand. 6. One quart of blood meal. 7. One quart of steamed bonemeal. 8. 2.2kg of Welcome Harvest Farm Flower Power. 9. 0 to 30 quarts of vermiculite and / or perlite. F. 1. One 3.8 to 4.0 cubic foot bale of Sunshine #2 Mix, Jiffy Mix, Pro Mix, or other soilless mix. 2. 9kg (20lbs) of pure earthworm castings (beware of imitators). 4. One 5kg bag of Welcome Harvest Farm Flower Power. 5. Perlite/vermiculite combination, as desired. G. 1. One 3.8 to 4.0 cubic foot bale of Sunshine #2 Mix, Jiffy Mix, Pro Mix, or other soilless mix. 2. 9kg (20lbs) of pure earthworm castings. 4. One quart of blood meal. 5. Two quarts of steamed bonemeal. 6. One quart of kelp meal. 7. One quart of greensand. 8. 0 to 50 quarts or any perlite / vermiculite combination. 9. Up to 1/3 parts soil. H. 1. One 3.8 to 4.0 cubic foot bale of Sunshine #2 Mix, Jiffy Mix, Pro Mix, or other soilless mix. 3. 20 quarts of well-decomposed compost. 4. One quart of bonemeal. 5. One quart of greensand. 6. 0 to 50 quarts of any perlite / vermiculite combination. 7. Up to 1/3 parts soil. Soilless mix is made from organic peat, which holds nutrients, moisture, and air very effectively. It is versatile for all climates, and the grower has complete control over the fertilizing of the grow medium. Also, it is pH buffered which allows pH control. To put it simply, it allows the grower to get high end results with minimal effort. Calcium peroxide, available under many trade names, can be added to any mixture. It breaks down into oxygen and lime and adds oxygen to the roots. Some people don’t like using blood meal, although it is one of the cheapest and strongest-acting dried nitrogen sources for the amount used. The numbers on the organic fertilizer packs do not represent the nitrogen of value to the plant, they represent the percentage of the fertilizer in the product. All organic nitrogen fertilizers release nitrogen at different rates. Other nitrogen sources are composted chicken manure, earthworm castings, fish meal, alfalfa meal, feather meal, and canola meal. Rock phosphate is a phosphorous additive. This can work well on its own or in combination with bonemeal. Bonemeal and rock phosphate release phosphorous for an entire growing season. Kelp meal and greensand are good sources, and so is langbeinite. Crushed granite is good, too, but it should be the type that contains a decent supply of potassium feldspar. Greensand releases slowly and for more than a season. Nevertheless, a cup per plant each year is good to add. Kelp has a single-season limitation. There is no substitute for the many trace elements that kelp releases. However, many mined minerals work well too, such as greensand, Pyro Clay, and Mineral Magic. Some liquid organic fertilizers, such as Earth Juice and Meta Naturals, have formulas that are made to contain trace elements. Size is important. Larger containers allow for lower maintenance. Larger plants grow better in larger containers when plants are fertilized and watered periodically, such as when the mix begins to dry up. For a cycle of more than 3 months, it is recommended to use 1 to 3 gallons of mix per month of total growth before harvest. The easiest method is to add a fertilizer application when the plants need a watering, then plain water can be used every second watering. The key to any fertilizing regime is not to overdo it, or to under do it. There are many water-soluble organic fertilizers on the market, such as Earth Juice and Meta Naturals. Plants should never be starved of water to the point where they wilt. Wilting leaves is a sign of neglect. When plants stay wilted, some leaves will begin to dry up and die. Organic fertilizers work well on their own, but they can be used in conjunction with chemical fertilizers. Many growers use dried and water-soluble organic fertilizers throughout vegetative growth, then switch to chemical fertilizers during bloom. Another approach is to use a synthetic blend of water-soluble chemical fertilizers during vegetative growth as well. Often, a single application of a cheap chemical fertilizer during vegetative growth will push a plant further than no application at all. All formulas from chapter 4 will work, but here are some more that have done well for plants in vegetative growth or flowering. During vegetative growth, applying one or more applications of a water-soluble chemical fertilizer, such as half to full-strength 20-20-20, will produce more vigorous growth. Adding Epsom salts (1/2-teaspoon per gallon) and the recommended rate of liquid kelp works well with a synthetic chemical blend. The beauty of adding the odd chemical fertilizer application with the organic mix is that plants do not need these chemicals on a regular basis, since so many other sources of the nutrition are already available. And the odd shot of chemical fertilizer will not build up salts in the soil to the point where reusing the grow medium in the future will give deficient results. Product quality will not be sacrificed if chemical and organic fertilizers reach a harmonic balance when used together. During bloom, one to three applications of a water-soluble chemical fertilizer such as GGold Nutrient Series, Miracle Grow 15-30-15, Plant Prod 15-30-15, General Hydroponics bloom, Dyna Bloom, etc., can be made. The dose can range anywhere from half to full strength. Epsom salts (added at 1/2-teaspoon per gallon) and the recommended rate of liquid kelp can be added to the chemical fertilizer, too. Fertilizers should not be added for the last two to three weeks of blooming, unless plants get a good flushing to remove salts in the growing medium no less than a week before harvesting. When procedures given in this manual are followed, the final product should be of top quality. However, flushing plants with lots of plain water two weeks before harvest and upwards until harvest can remove lots of salts. This flushing will improve the final product. In general, these formulas with organic mixes should work out fine without the need for flushing, unless many supplemental feedings are added. A major benefit of organic fertilizer usage is that salts are not a by-product of organic fertilizers, unlike chemical fertilizers, especially the cheap ones. Nevertheless, adding a few doses of chemical fertilizer during cultivation can increase the volume without sacrifice to quality. If flushing is necessary, using large amounts of plain water(ie. 3-4 times container size per flushing) or using one of the many flushing formulas available in the market today is recommended. These flushing formulas attach to the fertilizer salts and unused elements in the growing medium, so that they will be removed. Some clearing solutions come in flavors like pina colada and strawberry. They will alter the flavor. Some flushing formulas should be followed up with a dose of plain water in order to remove an undesirable flavor that they leave behind. Flushing formulas will come with instructions. When the indoor crop is finished, the mix can be reused, meaning that the grow medium can be used over and over again. This is beneficial: after each crop is done, the grow mix retains its investment value, since it can be reused indefinitely. The chart shows how mix volume increased year in, year out. Only new fertilizers need to be added for each additional grow. A. All roots must be pulled out of the mix. B. Tap water can be used to flush salts out of the medium, if chemical fertilizer was applied in excess. If fertilizer was not applied in excess, the grow medium only needs to be sterilized as described below. C. A PPM meter is used to measure the PPM of the runoff solution. When the runoff is near the same PPM as the tap water, the salts are gone from the mix. D. 1/2 to 1 tablespoon of calcium peroxide per gallon of mix can be added to the reused mix to help sterilize it. Adding 35% hydrogen peroxide at a rate of 2ml per gallon of water during watering can help sterilize the soilless mix, too. Giving the medium a good soaking before transplanting is a cheap and easy way to sterilize it.